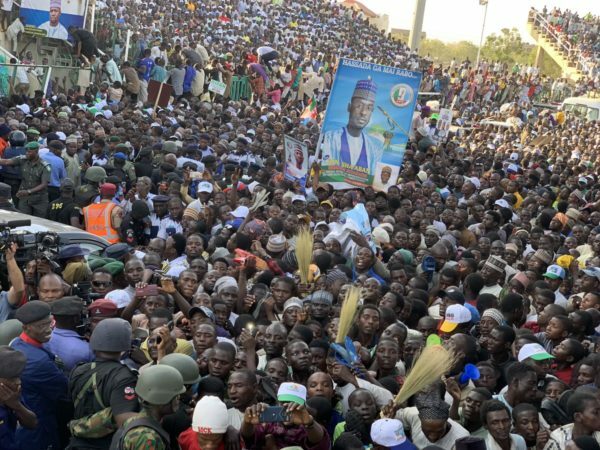 A mammoth crowd of supporters thronged the Sani Abacha stadium in Kano to receive President Muhammadu Buhari’s campaign train on Thursday. The President, while addressing the gargantuan crowd, said that his visit was not only to seek for re-election, but to also commend the people for their tireless support to his administration. “I am in Kano, not to tell the people what we are doing to develop the country, but to remind them of the need to perform their civic responsibilities by voting right candidates. He commended the people for welcoming him all the way from the airport Buhari and assured them of his determination to move the country to the next level. While on the campaign tour, the President also paid a courtesy visit to the Emir of Kano, Muhammad Sanusi II. The Emir commended President Muhammadu Buhari for initiating programmes to alleviate poverty in the country. “Programmes like the N-power and TraderMoni where small traders across the country are given N5,000 each, can go a long way in boosting the country’s economy,” he said. The Emir called on the president to initiate more of such programmes so as to ensure the wellbeing of all citizens. He also commended the federal government for introducing the school feeding programme, saying that the gesture had encouraged more parents to enrol their children in school. According to Sanusi, the Emirate Council will continue to remind government about issues relating to the wellbeing of Nigerians whenever the need arises.